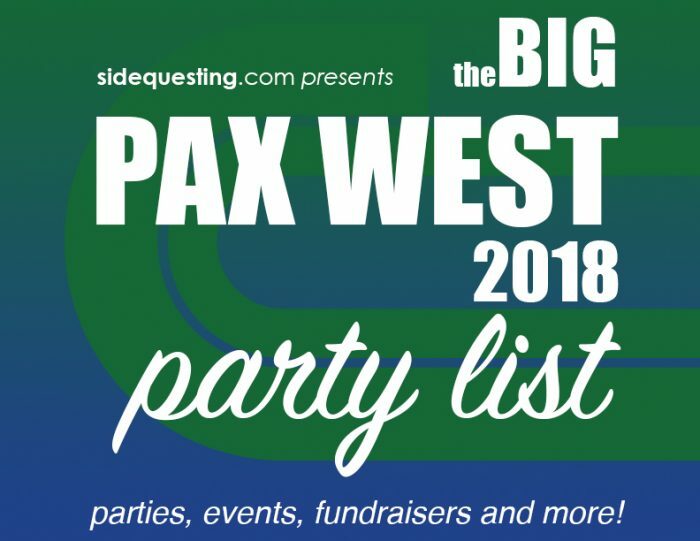 Home » Event » The 2018 PAX West Party List – Parties, events, concerts and more! Ayyyyy look out, Seattle! PAX West is back for another year, and so are we! It’s time to kick off the festivities of PAX West 2018 with our annual list of parties and events! We’ll be updating this regularly, so be prepared to find plenty of events to help you have a fantastic time at the expo. GIANT MEGA thanks to my co-admins on the FB group! FOLLOW THEM: Becky, Jacqui, Bryanna, & Brian! IDatXbox Pre-PAX Open House 2018 – 5-9M @ Microsoft Building 33, 16070 Northeast 36th Way, Redmond, WA 98052 – RSVP: FREE, Eventbrite – Info:Once again, we’re throwing open the doors at the Microsoft campus to kick off PAX West weekend with the latest ID@Xbox games, hundreds of gamers, and a special hands-on opportunity with guest titles: Forza Horizon 4, Ori and the Will of the Wisps, and The MISSING: J.J. Macfield and the Island of Memories! Double D20 Adventure Extravaganza – 6PM @ Kremwerk, 1809 Minor Ave, Seattle, Wa 98101 – Tix: $13 and up – Info: For one night only, the d20 Dames and Dungeons & Drag Queens roll the dice and improvise their way through two original adventures, played onstage before a live audience! It’s a night of real D&D — challenging encounters, thrilling combat, and hilarious misadventure. Extra Life Seattle Pre-PAX Hang-out – 6:30-9:30PM @ Flatstick Pub, 240 2nd Ave S, Seattle, WA 98104 – RSVP: Eventbrite – Info: 21 & Up, Let’s hang out and play some mini-golf and “Duffleboard” before the madness of PAX West 2018 begins! Enjoy 1/2 priced games at Flatstick Pub while connecting with each other, celebrating Seattle’s amazing Extra Life accomplishments! Space is limited to be sure to reserve accordingly! Brace Yourself for PAX featuring Kero Kero Bonito – 7PM-12AM @ The Showbox, 1426 1st Avenue, Seattle, WA 98101 – RSVP: FREE, Eventbrite – Info: 21+, To help our fans get ready for PAX West 2018, Brace Yourself Games is throwing an epic FREE party! Hosted by Elspeth Eastman, with exclusive swag, world premieres of two new Brace Yourself Games trailers, performances by your favorite NecroDancer musicians, and headliner Kero Kero Bonito! The Triwizard Drinking Tournament – The Cocktails of Grindelwald – 8:30PM-3:30AM @ Capitol Hill, Seattle (See diff routes here) – Register: FREE, Eventbrite – Info: Penny Arcade Boards | 21+, The Triwizard Drinking Tournament is a yearly charity pub crawl hosted by the Penny Arcade community in which the four houses of Hogwarts are split into two teams of fifty and unleashed upon Capitol Hill for a night of merrymaking and fund raising. GarciaBellamy presents: PAX Countdown 2018 – 9PM-1AM @ Neighbours Nightclub & Lounge, 1509 Broadway, Seattle, Washington 98122 – RSVP: FREE, Facebook – Info: 21+, Join us for the 4th annual and largest night before PAX party, and dance away to some geeky tunes. Thank you for your continued support of the Gay Gaming Professionals https://www.facebook.com/groups/6628203394 and we look forward to seeing YOU on Thursday! Oculus Stormland Pop-Up during PAX West – 11AM-9PM @ 1927 Events, 1927 3rd Ave, Seattle, Washington 98101 – RSVP: Facebook – Info: Join us at the Oculus Stormland Pop-Up on August 31 (open one day only!) to explore the game’s ever-changing cloudscape and expansive world. Demos are open to the public, not just PAX badge holders. Limited-edition swag available for those who demo, while supplies last. Bethesda Gameplay Days Fan Event – 1:30-9PM @ The Hard Rock Cafe, 116 Pike St, Seattle, WA 98101 – RSVP: Free until capacity – Info: Bethesda | We’re excited to announce that during PAX West next week, Bethesda will host fans for two days at the Hard Rock Cafe, for hands-on play, community meet-ups, and live presentations – both on stage and streamed – for many of our latest games. 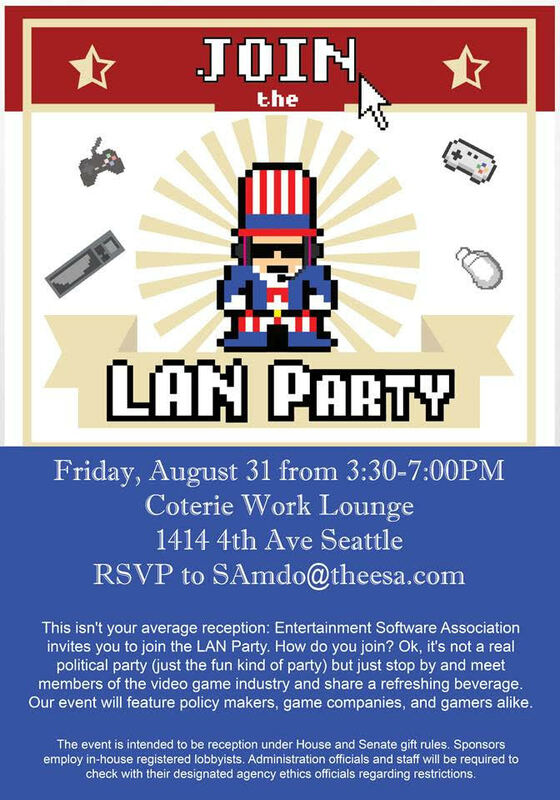 The ESA LAN Party at PAX West – 3:30-7PM @ Coterie Work Lounge, 1414 4th Ave, Seattle, WA 98101 – RSVP: Email Shaokyi Amdo (SAmdo@theesa.com) – Info: Have the chance to meet policymakers, industry and fellow game creators. Refreshments will be provided, as well as (hopefully!) stimulating conversation! Nintendo Minute Super Mario Party Party – 4-6PM @ Sheraton Seattle, corner of 6th & Pike, 1400 6th Ave, Seattle, WA 98101 – RSVP: First 30 people who arrive will be able to attend, line forms at 3:30PM – Info: Twitter | Play Super Mario Party, be on an episode of the show, and get some cool swag! DigiPen Alumni PAX West Reception – 5:30-8:30M @ Tap House Grill, 1506 6th Avenue, Seattle, WA 98101 – RSVP: Free | Eventbrite – Info: All DigiPen alumni are welcome to our annual PAX reception at Tap House Grill! Please feel free to RSVP for yourself and your plus-one. Life is Strange 2 Fan Meet Up Party with What’s Good Games – 6-9PM @ Unicorn, 1118 E Pike St, Seattle, Washington 98122 – RSVP: FREE! Facebook – Info: What’s Good Games | We’re doing it again! Thanks to our friends at Square Enix we are once again partnering up to celebrate Life is Strange. Last year we had a line around the block, so this year we are taking over the WHOLE venue at the Unicorn. WOWZA! Entry is free for all but the first 100 people in line will get free drink tickets. It’s open to anyone 21+ in the Seattle area, no PAX badge required. Night of Gaming for Good on Top of the World, PAX Edition! – 6PM-1AM @ Columbia Tower Club, 701 5th Avenue, 75th Floor, Seattle, WA 98104 – Tix: Starting at $69 – Info: Website | Proceeds go to Uncompensated Care program at Seattle Children’s Hospital. Play all night from our extensive lending library, with a variety of games to suit many tastes and play styles. Seattle Game Dev Meetup Presents: Enter The Grid (PAX After Party) ft. chipzel, bryface, coda, Graz, skybox) – 6PM-2AM @ Club Contour, 807 1st Ave, Seattle, WA 98104 – RSVP: Free from 6pm-9pm, $5 after 9pm – Info: This 3rd annual Seattle Game Developers Meetup PAX after-party features a special lineup of world-renowned chiptune musicians. Featuring chipzel (UK), bryface (CAN), coda (SEA), Graz (SEA) and skybox (SEA); Partlyhuman (CAN) on visuals. Musical performances at 9pm. Video Games are a Drag – 7-10PM @ Kremwerk, 1809 Minor Ave, Seattle, Washington 98101 – Tix: $8 – Info: Kremwerk proudly presents a video game-themed drag show, just in time for PAX weekend, where all performers will be doing numbers inspired by all things Nintendo, Sega, Atari, and beyond! The VR Social at PAX West 2018 – 7-10PM @ First & Bell, 2218 1st Avenue, Seattle, WA 98121 – Tix: Free | Eventbrite – Info: Join the Vreal team for an epic night of Virtual Reality! Play VR games, watch VR content in Vreal, eat tasty foods and win some sweet loot. Screenwave Media’s GIANT PAX West Party ft Minibosses, Kirby Krackle, & Professor ShyGuy – 7PM-2AM @ Re-Bar Seattle, 1114 Howell St, Seattle, WA 98101 – Tix: $11.09 | Eventbrite – Info: Facebook | Sponsored by Eagle Island, Screenwave Media is holding the hottest party to kickoff the PAX West festivities. Musical acts performing include minibosses, Kirby Krackle, and Professor Shyguy. DMC5 SSStylish Pizza Party – 8PM-12AM @ SPiN, 1511 6th Ave, Seattle, Washington 98101 – RSVP: FREE 21+ | Facebook – Info: Join us for a special evening with Devil May Cry 5 director Hideaki Itsuno and producers Michiteru Okabe and Matt Walker! Predator Gaming After Party – 9PM-2AM @ The Showbox, 1426 1st Avenue, Seattle, WA 98101 – Register: FREE | Ticketfly – Info: Website | In Partnership with Intel and PC Gamer. Enjoy hands-on game demos, swoop up exclusive swag, grab a drink and party with PC Gaming friends. The event-filled night will also include, a Play like a Pro gaming competition, a musical performance from headline DJ A-TRAK, giveaways and more! Lenovo Legion Lounge at PAX West – 9PM-2AM @ Showbox SoDo, 1700 1st Ave S, Seattle, Washington 98134 – RSVP: Free – Info: Join the Fortnite™ dance competition, meet esports experts, play the most popular FPS games on Legion by Lenovo gaming systems, strike a pose in our custom photo booth, become an FPS quiz champion and more. The DJ Sessions Presents the “On Location Sessions” “unofficial” TWITCH PAX After party – 10PM-2AM @ Eden, 1950 1st Ave S, Seattle, WA 98134 – Tix: $15-$25 | Eventbrite – Info: Lineup TBA. The DJ Sessions brings to you the best local, national, and world renowned DJ’s playing live sets and exclusive interviews. Our resident DJ’s will be on the decks LIVE mixing you the best sets. The Informal, Unofficial PAX 5K: Episode Four – 9-10AM @ Waterfront Park, 1401 Alaskan Way, Seattle, WA 98101 – RSVP: Free | Eventbrite – Info: For the 4th year (sorry we skipped 2017) we are running an informal, unofficial 5K at PAX West. We’ll meet at 8:45AM on Saturday, August 30 at the fountain in the Waterfront Park and start the run at 9am. The run (or walk) is a nice flat course along the water. Even more details about the course is located in our original 2013 post. Since this is unofficial, there is no requirement to have a PAX pass or anything like that. Just show up and have fun! SMASH: Battle Seattle 2 – 12PM @ Chop Suey, 1325 E Madison St, Seattle, WA – Tickets: Free to watch, $10 to enter | Eventbrite – Info: A Smash 64 and Melee exclusive tournament. $10 to enter, win cash prizes and goodies! Escape To The City: Super Sonic 90s J-Fashion Juicebox Jam – 2-6PM @ Freeway Park, 700 Seneca St, Seattle, Washington 98104 – RSVP: Free – Info: Facebook | Escape to the City is a queer Sonic renegade chiptune rave / j-fashion meetup / aesthetic hangout! 100% free, in the park at the convention center (head outside from the 4th floor and through the park to the plaza) on Saturday afternoon, no badge needed! Featuring Nanode, Skybox, 4lung, Alice Blue, Astro, and Slow Shudder! The MIX Seattle 2018 sponsored by Raw Fury – 2-11PM @ The Showbox, 1426 1st Avenue, Seattle, WA 98101 – RSVP: Website – Info: 2-6PM General Admission, 7-8PM Exclusive Press Hour, 8-11PM General Admission 21+. The MIX Seattle is a full day game developer showcase. Guests will have opportunities to play unreleased amazing indie titles, vibe with the teams creating them and get involved with prize package opportunities. Prize packages will include a Nintendo Switch, as well as contributions from Microsoft, Amazon, Raw Fury game codes and more! Mario Kart 64 Tournament – 7PM @ The Crocodile, 2200 2nd Ave, Seattle, WA – Tix: $15 to participate, $5 Spectator | Ticketfly – Info: 21 & over | Have what it takes to battle it out in Mario Kart 64? Join us at The Crocodile and find out! Quiplash Live (Stand-Up Comedy) – 7-8PM @ The Pocket Theater, 8312 Greenwood Ave N, Seattle, Washington 98103 – Tix: $14 | Buy at the box office – Info: You knew comedy has losers, but did you know there are winners too? That’s where you come in. In Quiplash, the party game by Jackbox Games, the audience decides the outcome as comedians are pitted against each other in a battle of words. An Evening with Extra Credits and Puzzle Break – 7PM-12AM @ Sole Repair Shop, 1001 East Pike Street, Seattle, WA 98122 – Tickets: $10-$25 | Eventbrite – Info: Come hang out with the crew of Extra Credits and fellow fans of the channel! We are also teaming up with local favorite escape room company Puzzle Break to provide you with additional entertainment. Facebook Gaming PAX West Party – 8PM-1AM @ Fremont Studios, 155 N 35th St, Seattle, Washington 98103 – RSVP: Facebook – Info: 21+, We’re excited to see you at PAX West! Join us for food, full hosted bar, games and music. Entry is first come, first served until at capacity. Your PAX West Badge is required for entry. Please bring valid, government issued IDs for venue entry. RSVP does not guarantee entry. Pink Party Prime X – 9PM @ Neumos, 925 E Pike St, Seattle, WA 98122 – Tix: $15, Eventbrite – Info: 21 & over | Facebook | It’s back, and it’s bigger and better than ever. 10 years in the making, it’s Pink Party X, presented by ArenaNet and brought to you by Queerspace Magazine and Queer Geek! The DJ Sessions Presents the “On Location Sessions” 4LOCAL “unofficial” TWITCH PAX After party – 10PM-2AM @ Pike Brewing Company, 1415 1st Ave, Seattle, WA 98101 – Tix: $15-$25 | Eventbrite – Info: Lineup TBA. Featuring InMotion Productions & Ocean Groves. Seattle Indies Expo 2018 – 12-9PM @ Motif Seattle, 1415 5th Avenue, Seattle, WA 98101 – RSVP: Free, Eventbrite – Info: Website | SIX (Seattle Indies Expo) is a one-day exhibition for independent game developers to get together, socialize, and show off their stuff. [SOLD OUT] PAX West 2018 – ArenaNet Community Party – 7-10PM @ Gordon Biersch Brewery Restaurant, 600 Pine Street, #401, Seattle, WA 98101 – Tix: FREE – Info: Join us Sunday night during PAX West for a Guild Wars 2 community party! Spend the evening chatting with ArenaNet devs, enjoying appetizers and drinks, and maybe winning some GW2 raffle prizes! Official HuskyCon PAX West Meetup – 7-11PM @ Elephant & Castle, 1415 5th Avenue, Seattle, WA 98101 – Tix: FREE | Eventbrite – Info: Come join the Huskycon crew once again at our annual PAX West Meetup. We’ll hang out, we’ll talk, we’ll drink a bunch. NPC Collective Presents: Nerdcore Night at the LoFi – 7PM-1AM @ LoFi Seattle, 429 Eastlake Ave E, Seattle, Washington 98109 – Tix: FREE with PAX Badge, $7.00 for general admission at door – Info: Facebook | The NPC Collective returns to entertain at PAX West! Back at home in the LoFi, enjoy the nerdcore stylings of some of the finest MCs from across the US. The Messenger PAX West Party – 8PM-12AM @ Hard Rock Cafe Seattle, 116 Pike St, Seattle, Washington 98101 – RSVP: Free | Facebook – Info: Come celebrate The Messenger’s launch with the team and industry friends! We’ve got booze, poutine, and live music from Rainbowdragoneyes, who made all those sweet tracks for the game! You do NOT need a PAX West badge to get in. Poropalooza: Poros in Wakanda – 9PM-2AM @ Q Nightclub, 1426 Broadway, Seattle, Washington 98122 – Tix: $15 cover, $10 cosplayers, free for Enforcers – Info: Facebook | Poropalooza is BACK! Dance it off at the club that doesn’t quit with some of your favorite ESports players, Influencers and with geeks from every fandom. Fortnite at PAX West @ 8th & Pine, Convention Center – Tix: Free, all ages – Info: Website | Join us at a viewing area for the Fortnite tournaments, food trucks and a merch store carrying exclusive Fortnite swag! Mini golf, and more! Magic at Mox Boarding House– Friday-Sunday @ 5105 Leary Ave NW Seattle, WA 98107 – RSVP: Free – Info: Website | We’ll have special guests and a different play experience each night. Space is limited, so be sure to stop by the learn-to-play booth for more information if you want to participate. FANDOM Monster Hunter Cafe Food Truck @ PAX West – Saturday – Sunday @ Several Locations – RSVP: Eventbrite – Info: Chase the FANDOM Monster Hunter Cafe Food Truck using #FANDOMMonsterHunger to see sneak peaks of the menu & for live updates on locations. We will be traveling around the surrounding area of PAX West handing out themed, free food!